However, raccoons are known for eating anything that they can get their highly adapted claws on. This is one main difference between raccoons and bears, and has helped determine its classification as separate from Panda bears. While Pandas might eat both plants and meat, raccoons are primarily herbivores, tending to prefer herbs. The spelling of the word raccoon is something that has also been under scrutiny. It has been spelled both raccoon, as well as raccoon. Other names for the raccoon include the North American Raccoon and the Common Raccoon. When raccoons are in the wild, their lifespan ranges between two and three years, though some raccoons have lived up to sixteen years in captivity. Raccoon range in size from 23 to 37 inches, and weigh between 3 and 23 pounds, though some adult males have weighed in at over 40 pounds. Raccoons are widely recognized for their distinctive facial markings. 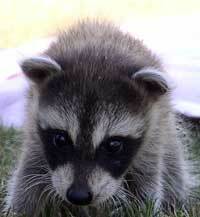 Raccoon face and muzzle areas are white, with black banding across the eyes. Black bands are also evident as a strip pattern across the tail. Raccoon fur is a mixture of black, white, and gray. Raccoon front paws are extremely sensitive and it is believed that the habit of washing or submerging their food in water before eating isn't in respect to hygiene, but to the fact that their paws are sensitive. It is believed that when Raccoon put their paws in water, they have a greater tactile sense, and can handle their food more easily. Raccoons range throughout the United States, extending as far as Canada and as southern as South America. They are seen in Mexico and are being introduced to areas of Asia and Europe. Since the raccoon is highly adaptable, they live in a wide variety of places. Raccoon are often seen in woods or forested areas and they prefer to be close to water. Once seen only in deciduous forests, raccoons are now commonplace in suburban areas. They create homes called dens, and though they prefer to make a den in a tree, they will easily move into attics, basements, abandoned farmhouses, barns, and sewers. Raccoon are also frequently found in mountain regions as well as marshes along the coast. Raccoons will move anywhere they can find shelter. Raccoons set up a home range, where they make their dens. The raccoon home range consists of areas where they find their food, or regular hunting grounds. Ranges can vary in distance, but ranges as far as one mile have been recorded. Raccoons are omnivores, enabling them to eat both meat and plants. They also prefer to roll their food in water, though debate remains whether they are washing it or just softening it. Looking for the perfect opportunity to dine, raccoons spend a great deal of they day rummaging through trash, and can even be seen using their front claws to pry open cans. By water, raccoons prefer to eat fish, clams, frogs, and other water creatures. They take their food and dunk it in water, as well as use this method for finding and retrieving their aquatic catch. When raccoon are in the forest, they will feed on nuts, seeds, and berries as well as bird eggs, decaying animals, and insects. Raccoon aren't known for their hunting abilities, however they will catch smaller mammals such as rats, mice, and squirrels for food. Raccoons are very maternal and the bond between mothers and their young is a strong one. The offspring remain with their mothers for the first year, and then move on. Having a gestational period of 65 days, raccoons often bear between 2-5 young, known as kits. Raccoon mating season ranges between January and June, with the peak season between the months of March and April. Raccoons are nocturnal creatures, making sure that they perform the majority of their activity at night. They sleep throughout the day, wherever they have made their dens. Raccoons are known for their agility and are often thought of to be entertaining creatures, however they can be very aggressive. Once believed to be solitary creatures, it is now shown that raccoons do live in social groups with other raccoons. However, these groups appear to be limited to gender, with same gender animals living in the same den. Raccoons are extremely populous in the United States, and it isn’t uncommon to see them in cities as well as in their natural habitat. Raccoon Age at Maturity: 8 - 12 months female. 2 years male. Raccoon Length of life: 18 -21 years in captivity. 5 - 15 years in the wild. Raccoon Diet: In Forest nuts, seeds, and berries as well as bird eggs, decaying animals, and insects.